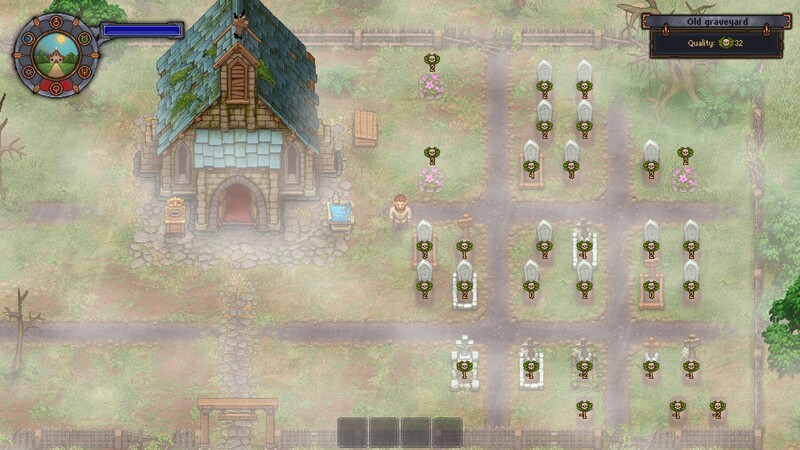 In Graveyard Keeper, you play as a man who was killed in the present day who finds himself now stuck in the past. He is the graveyard keeper for a local town, and his only way to get back is to tend to the land and figure out what is going on. To do that, he is tasked by the locals, the church, and even a talking skeleton head to do tasks. As with Punch Club, progressing through the different needs of the town will unlock new features and systems to make use of. Your first major task involves handling corpses that are dropped off by your friendly talkative donkey. You must prepare the body for burial by removing organs, before burying them and tending to their grave. The graveyard has a quality value that goes up or down depending on the upkeep of the graves and the quality of the bodies. As you complete work around the land, you’ll gain three different kinds of experience used to unlock new options in the tech tree. 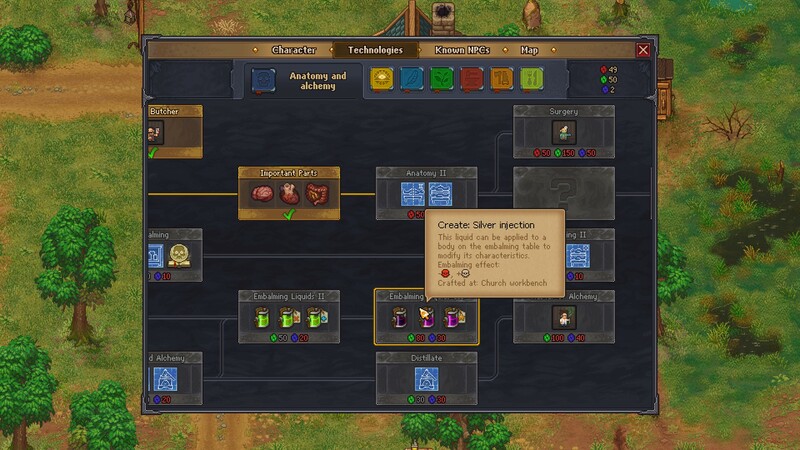 Going up the tech tree is the only way to become self-sufficient and perform Graveyard Keeper’s main goal: lots of side quests. Progress and new features are all tied to the quests that you’ll find around the town. Most of the named NPCs will have quests for you to do which in turn will unlock new features or move the story along in some way. Many times, one character’s quest chain will intersect with another; leading to a “Borrow from Peter to pay Paul,” situation. There are three main areas of gameplay in the title. You have your land that allows you to smith metal, grow crops, and so on. There’s the graveyard itself and the church you can eventually run, and then you have a dungeon full of monsters to fight. You always have something to do or go after — all it takes is lots of time. 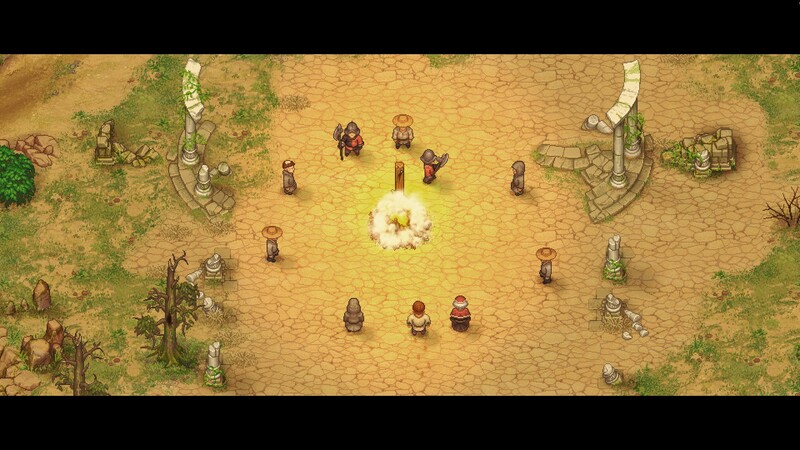 While Graveyard Keeper offers a lot to do, it fails in keeping things engaging. 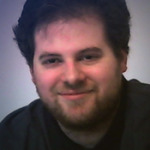 As with Lazy Bear’s previous game Punch Club, grinding is a major part of the gameplay loop. You are going to have to grind to refine resources to produce items, grind tasks to get experience to unlock new features, grind the various areas to get enough money to move things forward, and more. There are so many little pain points with playing Graveyard Keeper that start to take their toll. You have various stashes and trunks to store goods in, but the game doesn’t pull from all of them when performing work or construction. This means you have to run back to the stash, make sure you grab enough resources, and then run back to whatever it is you are trying to build. Cooking and blacksmithing take real-time minutes in order to work, not to mention traveling to bring resources to and fro… speaking of “to and fro,” there is more to it. Mining and chopping trees will sometimes yield larger items that can be broken down for more resources. However, in order to use them, you must bring them back one at a time to your resource stockpile. In order to sell goods, you have to transport them to the town, but each vendor only takes goods related to their craft, and there’s no way of knowing what the value of each item is unless you bring it to town. To add salt to the wound, the game at this time features no quality of life upgrades that you can unlock — no increased movement speed, no inventory upgrades, no energy upgrades; not even the ability to sell goods easier. At best, the one thing you can do to speed things up is to unlock shortcuts in the tunnels underneath your home. Now, you may have noticed something about this review, we’re spending an awful lot of time in a game called “Graveyard Keeper” without talking about the graveyard at all, and that takes me to my final set of problems. Despite the spooky and occult plot, and the fact that your friend is a talking skeleton head, there is very little involving the graveyard of the game’s title. I was expecting a lot more in terms of management when it came to the running of the graveyard and church. There are slight mechanic growths in the form of being able to enhance the quality of the church and graveyard items, and embalming fluid for corpses, but they’re locked behind the grinding of everything else. Getting blue experience, which ties a lot into the church upgrades, is very hard to acquire. It dawned on me as I was running around for the umpteenth time that I wasn’t playing a game about running a graveyard; I was playing a grindier version of Stardew Valley. Even the act of getting corpses slows down due to a story condition that locks additional corpses behind the farming system (I’m not kidding). Even though Stardew Valley is more open-ended, it does a good job of presenting the player with a variety of tasks and lets them do things at their leisure. The more you do task X, you get upgrades associated to that task — encouraging you to do what you like more. Here, completing one task simply gets you another, longer, task to go after. And as the time between grinding and success gets longer, it becomes harder to stay invested in the game. Before we end this review, it’s important to point out that the developers have already released a few balance patches for Graveyard Keeper since release. There is a possibility that these complaints may not be relevant at some point in the future. However, as we always say: we can’t judge a game now for future content. Graveyard Keeper has an interesting hook that the game just doesn’t seem to know what to do with at the moment. I played this for a while on release day but haven’t jumped back in. I had hope it would be more graveyard-oriented and less Stardew Valley, but as you say, it’s not. I’m not looking for grindy games but intend to check in again and see how it evolves.